It was in May of 2012 that I found this rather large poster attached to the wall above the door of the cafeteria of the middle school my then-middle schooler attended for two years starting six years ago. I photographed it only because of how the word alcohol is spelled on the can. We can't see how it ends, but we know it starts ALCH. It wasn't till after I called the photo into Photoshop and examined it that I found other reasons it deserves a treasured place in this list of Fun Pix, sort of like the one here. 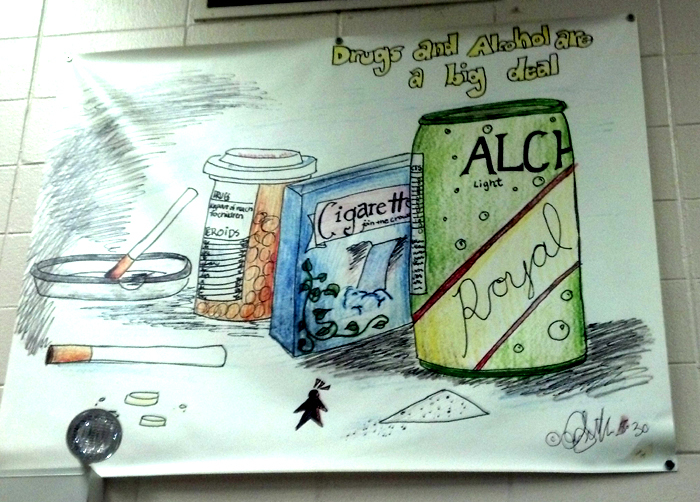 To begin at the beginning, I'm not sure the message you want to send is that drugs and alcohol are a big deal. That could so easily be interpreted the wrong way, as in, "Yeah, dude, school is a drag, so getting high is a big deal to me." It would have been so easy to compose an unambiguous message. And it would have been so easy to get the capitalization right. If you're going to capitalize "alcohol" then you have to capitalize "big" and "deal." If you're not going to capitalize "big" and "deal" then you have to set "alcohol" in lower case (and add a period at the end). Either way these are two mistakes I would have preferred every student at Trailridge had learned not to make. It's hard to tell, so take my word for it that on the pill bottle, above the word STEROiDS (yes, with a lower-case "i"), it says, "KEEP OUT OF REACH FO CHILDREN." I know, you're thinking the artist is dyslexic, which is how ALCOH turned into ALCHO and how OF turned into FO. And you might be right. But that doesn't explain how the artist managed to get both cigarettes lit at the filter end. Take a look, and you'll see that the cigarettes are lit -- and emitting smoke no less -- from the filter end. You don't have to have smoked or lit any cigarettes -- or even seen any cigarettes lit by others -- to figure out in a couple seconds that it can't possibly make sense that you would light the filter end and put the non-filter end in your mouth, yet the artist shows not just one but both cigarettes that way. And the cigarette that's in the ashtray is set at an impossible angle. It could rest that way only by magic, not as the result of dyslexia or physics. And the package those cigarettes no doubt came from is out of proportion to at least 99% of real cigarette packs sold in the U.S. Whichever dimension you choose, the other two are wrong. Again, not dyslexia but rather a failure to try hard enough. I will say, though, that the message under the word cigarettes, which I know you can't read, is appropriate: "join the crowd." Cigarette makers figured out a long time ago that they have to replenish their market of customers (who typically die younger because they use the product) each year by getting people hooked young, because so few adults are foolish enough to start smoking, so the suggestion to join the crowd is just the message cigarette makers want to reinforce: "Hey, dude, smoking makes you look cool and sophisticated and grown up." As to the weird little person at the bottom, the marks above his head are not tiny text you can't read, they're just what they look like, which is three triangles. The meaning of this person with the triangles is an utter mystery to me. As is the meaning of the odd triangular shape to the right of him with the dots in it and more dots drifting off to the left. At first they might make one think of cocaine chopped up on a mirror, but that instantly makes no sense not only because no one would have cocaine both on the mirror and off of it but also because no one, I assure you, would use a triangular mirror. This poster needed adult supervision.